RV Tire Safety: How do I know what my hot pressure and temperature should be? How do I know what my hot pressure and temperature should be? “I just read your article on tires and speed. Seems that most RVers would stay around 60 mph here in the USA since it is the best speed for gas economics along with tire wear. 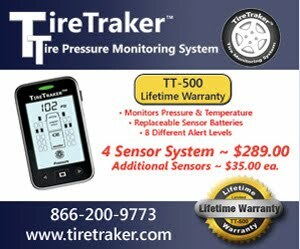 That being said I would love to hear your thoughts on tire pressure/temperature monitoring systems. I have a class C 28' Four Winds and as a new person to the RV world purchased a monitoring system. In my travels I get a variety of readings from tires and sometimes am concerned as to the pressure max and temp max. All six tires are exactly the same but in all my reading I find it impossible to get opinions or facts on what to expect in pressure and temperature from cold temps to normal driving pressures and temps. Great question Bill and welcome to the world of RV ownership. I know you would like an answer like “the Max temperature is 149.6°F and pressure increase of 12.8 psi” but as you are learning with tires nothing is that simple. First off I strongly support having a TPMS. Even if you check your pressure with a good digital gauge every morning, how will you know if you drive over a nail as you pull out of the campground at the start of your day’s travels? Next you need to get your real individual tire loads with the RV fully loaded to be sure you are not overloading any individual tire. You have a Tire Placard that indicates the recommended cold tire inflation you should follow until you know your real loads and calculate your personal minimum inflation levels. As you work through my earlier posts you will see the general guideline for pressure increase of about 2 percent for every 10°F, so if you set your cold pressure to 80 psi in Oklahoma City in November and it's 45°F you may see your cold pressure has increased to 86 psi in Phoenix the next morning when it is 85°F. If you watched your tire pressure during your trip you might see the tires run from five psi to 20 psi above your cold pressure as the tire temperature warmed up to 20° to 50°F above ambient. This increase in tire temperature is affected by many variables such as load, speed, air movement around the tires (inner duals will usually run hotter) and moisture content of the inflation air and actual tire inflation. Also if it starts to rain you will see a very quick drop in tire temperature and an attendant drop in pressure as the water draws away the heat being generated in the tire. Be sure to check out “Quick post on Max tire temperatures” and Tire Temperature & Pressure - A Hot Topic and Are tire pressure monitoring systems “TPMS” worthwhile? Thanks for the answer. I have yet to get to a weigh scale to find my true RV weight. Rental companies say to be safe they keep most rigs like mine at 80 psi which is the max cold pressure. I guess that says it is far better to be high on pressure than to ever let it get low regardless of the weight. As a rental co. they can not predict what people will put in their units. Makes sense. I am keeping a log on my trips showing pressure and temp along with ambient temp. TPMS is a POMM "peace of mind machine" in my book!! How fast is safe to drive on your tires? Looking for FACTS on Mission brand tires.